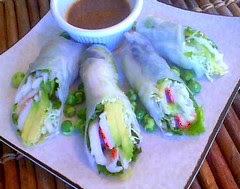 Food Wishes Video Recipes: California Spring Rolls – I used imitation crab, for real! California Spring Rolls – I used imitation crab, for real! I get the occasional request for a sushi demo. I usually tell the viewer (politely of course) to go out for sushi and leave me alone. Properly made sushi is an art and take decades of practice to master. Now, of course I could fake my way through a simple California Roll, which is just the basic crab, rice and avocado rolled up in a Nori seaweed wrapper. But, even that requires properly cooked short-grain sushi rice which is quite easy to mess up at home. So I came up with this idea to combine the components of the California Roll and present it in Spring Roll form. If you saw our Chicken Caesar Spring Roll clip, you saw how easy (and healthy) spring rolls are. They are fast, beautiful, and perfect for the summer, when you just don’t want go anywhere near the stove. These rice paper wrappers are found in any store that sells dry Asian noodles, which is every large grocery store. You’ve never seen them because you’ve never looked for them; they’re on the bottom shelf. Regarding the imitation crab I used for this recipe clip. If you’ve never thought about using it, it’s time to give it a try. Imitation crab has come a long way since it hit the market many years ago. It used to be fairly low quality; a little bit of Pollock, a lot of vegetable starch and other fillers, and probably a dose of good old Red Dye #2. Well, these days there are some very good quality varieties to choose from. READ THE LABELS! As I show in the clip, while still made mainly from Pollack many are also flavored with many different “real” fish and shellfish extracts including scallops, lobster, salmon, etc. It’s also a fat free food! You may be surprised to know that many Sushi Bars actually use this higher quality imitation crab in their California Rolls, as the real crab would be cost prohibitive. Trust me, if you’re paying $2.75 for that California Roll, you’re not getting fresh Dungeness crab! Can you tell the difference? I hope so. There is nothing like fresh, sweet crab. But that doesn’t mean you shouldn’t also use the imitation crab for recipes like this. It’s inexpensive, delicious, and if you read the label, pretty nutritious. By the way, stay tuned for the very simple Wasabi dipping sauce I used along side these. Enjoy! Great idea... Now, give me the sauce, I'm hungry now! Gorgeous recipe, Chef John! You make the whole avocado cutting thing look so gracious. I really want to know what it's than sauce though! Oh - and great call with the wasabi peas as a garnish. I am hooked on those things. I can sit there and eat a whole can, wasabi-nasal-burn and all. Thanks. Yes, they hurt so good! mmmmmm....wasabi endorphines! I've been watching you for a while but this is my first comment. And...uh...it's a request (please don't kill me). I wanted to know if you could show us how to do Pasta Carbonara. I'm a college student and I can't afford the $21 it costs at the only restaurant in town that makes it. Anyhoo, thanks for the videos and...um...I'll leave you alone now. I know you said a couple of hours, but will these last in the damp paper towel if I make them the evening before for the pot luck lunch the next day? I have done them overnight,but the wrapper can become a bit tough. Also the avocado may lose its bright color. I would do a test to make sure. Or bring the stuff and set up a "rolling station"...might be fun. Hey! It's Harry the 13 year old, I posted a comment on your deja vu video. Anyways I noticed you used cold water, you're supposed to use warm. How do I know this? I'm Vietnamese, but since it is a California Roll I guess it's okay, but I live in California though haha. Anyways thanks for setting up an Appetizer category it's awesome! Still waiting for that darn gingerbread video to go up though. P.S. I always post my comments as Anonymous because I don't want to go through all the trouble by making an account anyways, happy holidays! Hey Harry, Just use the "nickname" button, and you can any name you want, without a fuss to sign-up and sign-in. I m soooo frustrated,... I can't hear you speaking over the noise of the music! Is there a place to go to see the recipes written? They all look ssssssooooooo good!!! i'm not what music you are talking about, there is no music while instructions are being given. i really have no idea what your referring to. I just checked again and can clearly here my narration without issue. I hear no loud music. radishes would be good in those. Good to see you use the sarumi, it really seems to be healthy, processed as hell but still. I live near Tampa and it is too hot and humid usually to cook much, so thank you Chef. I've Never "Bean" That Scared Before! Wasabi Dipping Sauce – How much can you take? Was it the Last Supper? Spicy Orange Chicken – So not authentic! Simple Sherry Vinaigrette – Shake it baby! Chicken Parmesan – All you baby cows can relax! And the winner is…Chicken Parmesan! I Can't Decide. What Do You Think? A Scene from the Best Food Movie Ever!